The four O’Malley aides heading to South Carolina will work on the gubernatorial campaign of Vincent Sheheen and the lieutenant governor campaign of Bakari Sellers. Sheheen is mounting a repeat bid against South Carolina Gov. Nikki Haley, and Sellers, a state legislator, is considered a rising African-American star in the party. 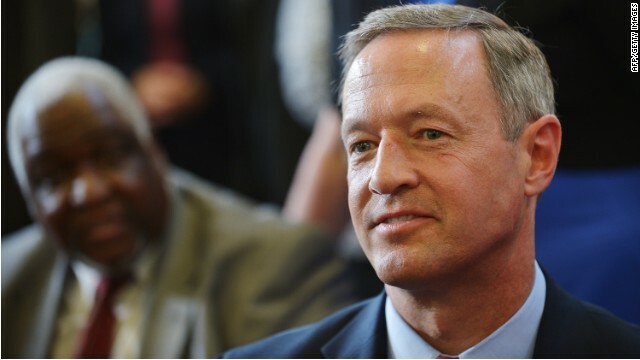 O’Malley has already raised money for both Democrats, making him the only potential presidential contender to assist their campaigns, collecting valuable on-the-ground political intelligence in the process. The “Ready for Hillary” super PAC also boasts of field staff doing spadework in Iowa, New Hampshire and South Carolina, along with other states, but Hillary Clinton herself has yet to campaign for midterm candidates this cycle. She and her husband, former president Bill Clinton, will make their first foray into Iowa next month for Sen. Tom Harkin’s annual steak fry next month. The do nothing blue dog dem party of no has not got any good solutions . Just more unfunded wars and handouts and are very anti woman they just want to make you all poor and beat you to your black and blue until your a gay strait dem and lacking 3 french fries having a happy meal kicking a can down the road with a sad look on your face and all broke down and chapped up and sick . I know you like this guy and all, but hey ... would you try and get him to change the name of his super PAC? "O’Say Can You See" just isn't doing it for me. Got to shoehorn hillary in there somewhere. Guess the Carolinas dont have enough money to got there for her. But she will heavy campaign in the United States.. All 13 of them..! Why do I keep getting the feeling that Democrats are going to pull a Statue of Liberty play when it comes to selecting a nominee for 2016? I really do not think that the nominee will be Hillary. She missed her best opportunity in 2008. While O'Malley was governor of Maryland they put in place a "RAIN TAX"!!! What's next a "SUN TAX"? Here we go again, folks, with the "3 French fries short of happy meal" joke, again. Hmm. Another one positioning for a VP nod. Sounds like someone has it for the gays, exit closet already. Yup, them meddling Democrats, trust me, your a little confused pal, unless you have examples of the Democrats calling for war, or eliminating a woman's right to an abortion, and access to birth control. And how nice of you to make that decision for them, they can't control their bodily desires, how could they possibly think they could make a rational decision there . I gotta tell you as much as I enjoy this site I'm really pretty a poltical. I don't like our POTUS getting stomped on when he's been doing a helluva job with the crap he inherited, so I'll speak up about that. I don't like these Teahadist Republikkklans tearing up my country (our), crapping on the middle class and scaring the beejesus out of folks, so I'll talk about that. Don't like liars and haters so...well you get it. My point is that O'Malley is alright. But I must tell you babe, that little half-step misstep with those immigrant kids not being housed in Maryland....that didn't sit too well with me. Your point is well taken though. Wonder what he was thinking...or smoking? !